Turf Hacker: Yellow Patch Attacks! Lesson Learned. This summer I set out a disease management plan aimed at controlling Fusarium Patch with as little traditional pesticides as possible. So far this plan has been very successful at controlling M. nivale but in the past 2 weeks I have been caught off guard by another disease, R. cerealis or yellow patch or cool season brown patch or, or or or etc. Historically R. cerealis or yellow patch has never been a disease of concern for me. Last year I wrote a post outlining how I have never had to do anything for this disease on my greens ever. Since writing that post I have learned a lot about disease management. While the message remains the same my experience has changed quite a lot. When I wrote that post I was still regularly using traditional pesticides as needed on my putting greens. I was using a lot less than in previous years but I was nowhere near the lack of pesticide use that I am at today. Since May I have sprayed 2 fungicide apps to my greens for fusarium, 3 greens have received no pesticides to date. I also did a small spot application last week to two of my greens for fusarium. This does not include regular Civitas and phosphite applications. It has been 2 months since my last traditional pesticide application. The worst of the R. cerealis on my putting greens. Full shade. I think the destruction caused by the R. cerealis to my putting greens has been so bad for two reasons. The first is the lack of pesticide use and the second is my fusarium management plan. In previous years the rather regular application of broad spectrum fungicides probably provided a level of control for the R. cerealis even though my intended target was M. nivale. This is one of the problems with broad spectrum products and also one of the benefits. As the fusarium was much more prevalent and destructive than the yellow patch and also occurred under the same environmental conditions I never had a problem with the yellow patch. With the success of my cultural control and organic pesticide plan I am seeing yellow patch progress to a destructive phase that I have never seen before. The second reason for this outbreak is my Fusarium Management Plan. The biggest flaw in this plan that I failed to account for any other disease that I might encounter. The reason I made this mistake is that I had never in 12 years ever encountered another fungal pathogen this time of year! This is something that I think a lot of other turf managers fail to realize about pesticide reduction. In the past, through the regular use of pesticides, we have covered up a lot of the lesser diseases while combating the ultra destructive ones. So while attempting to further reduce my pesticide use I have actually not made any difference this fall as other diseases that I didn't manage for popped up. My bad! Disease symptoms are much less sever in areas with little to no shade. Next year I will have a better grasp on my thatch issues as well as this season I did not have any means of topdressing my greens which should reduce this disease a bit. So lesson learned and I hope it won't end up being a tough lesson as the winter progresses. For the most part damage is not extremely widespread and a corrective fungicide application should hopefully help. As always I will be leaving some knock out trials for yellow patch to see just how bad this disease turns out to be. As it is winter having poor quality greens isn't a huge issue so it will be interesting to see how the untreated areas end up in the spring! So if you are attempting to reduce your pesticide use be sure to include any other potential threats in your plans even though they haven't historically been a problem! Don't just manage for your usual main pest. My hope is that others will learn from my mistake on this one. Great post Jason! I saw the very same thing at Northland as we reduced our pesticide applications aimed mostly at dollar spot, we noticed an increase in take-all patch and yellow tuft. 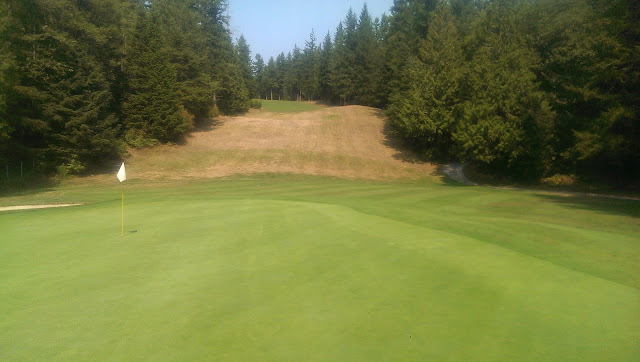 This fall we made an application of Headway for take-all and the yellow tuft was non-existent. The law of unintended consequences is coming into play here. We are certainly doing the right thing, but as you said, we need to look more into what the other consequences might be.